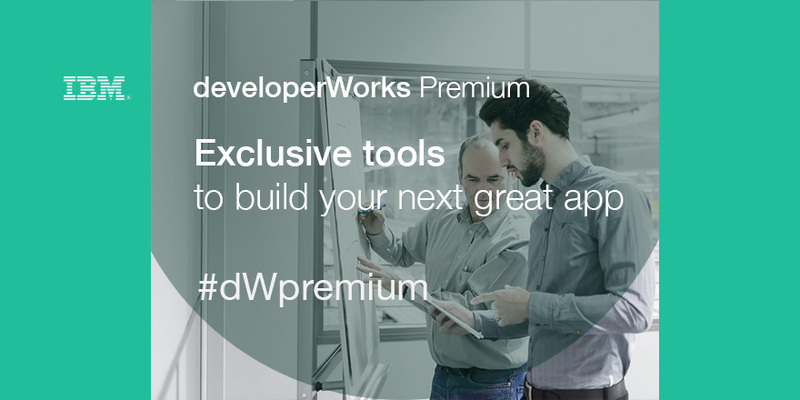 One of the oldest and most-popular developer communities, IBM’s developerWorks has announced a first-of-its-kind premium subscription model, developerWorks Premium, geared toward maximizing developer access to IBM’s software, tools, training and partners at a fraction of the cost. Yes, developers can be paid exuberant salaries, but to get to that level, they have to have the skills to justify the cost. Developers today are constantly trying to keep up. They want to learn, develop and connect with the best minds and the best tools. Many truly great ideas and solutions are unrealized simply because the cost for the tooling and resources can be prohibitive. As a novice developer, it can be expensive to play in a sandbox long enough to gain the skills needed to get into production. And for an experienced developer, it can be expensive to prototype and build state-of-the-art apps without paying big bucks for the power behind them. The new developerWorks Premium annual subscription was created to give developers unprecedented access and value to learn, develop and connect utilizing exclusive, member-only curated tools and resources including unprecedented access to IBM’s award-winning Bluemix cloud (platform-as-a-service) and Softlayer’s extensive global network of virtual machine data centers. Bluemix enables developers to incorporate innovative services like Watson, IoT and mobile along with third-party APIs like GitHub, Box, MongoDB, Twilio and SendGrid creating limitless application development possibilities. Bluemix allows on-demand cloud development anytime, anywhere from any browser, while Softlayer provides the highest performing cloud infrastructure available today. Developers are now able to move from prototype to production in minutes. With developerWorks Premium, subscribers will be able to lock in the annual rate of $399 USD, and receive $1,700 USD worth of the best of the best services at a fraction of the cost. Access to over 500 titles (including online books, videos and conference replays) from Safari. Developers at all stages will have all the tools and resources they need to take their career and projects to the next level. Developers can check it out and subscribe here. Be sure to watch out for the India launch in the first week of November!